We have for our esteemed clients a quality assured range of Rotary Kilns. These cylindrical vessels are inclined slightly to the horizontal and supported on two or more types Material is fed through the upper end of the cylinder which moves downwards to the lower end. 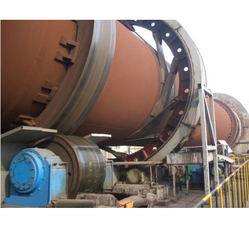 Our company has achieved widespread recognition in providing Rotary Kiln. Kilns are thermally insulated chambers in which a controlled temperature regimes are produced. Essentially used to harden, burn or dry materials or smelting ore to extract metal, kilns are supplied with our turnkey sponge iron plants. Our kilns are made of superior quality raw materials. We manufacture an extensive range of furnaces and kilns for industrial and commercial applications as well.